MC0 Series | Film Capacitors - Electronic Concepts Inc. The MC0 Series is specifically designed for low-drift, tight tolerance applications that require voltage to 400VDC, a continuous operating temperature to 125°C and capacitance tolerance as low as 1%. 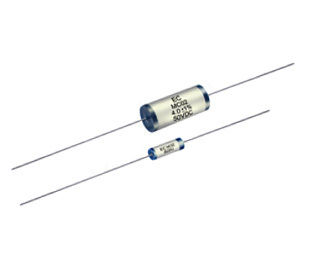 The MC0 Series is a new polycarbonate, film capacitor developed by Electronic Concepts to meet the ever changing, more demanding requirements of circuit designers. Although not called for, it is built to MIL-PRF-55514 to maximize reliability. The MC0 Series is specifically designed for low-drift, tight tolerance applications that require voltage to 400VDC, a continuous operating temperature to 125°C and capacitance tolerance as low as 1%. There is also a temperature coefficient of ±100ppm and a dissipation factor <0.3%. Importantly, the MC0 Series features a unique dual moisture seal construction (versus the single seal method of others). Dual sealing ensures greater overall electrical integrity with long term stability – and imparts the ability to accommodate adverse environments normally associated with the electronic industry. With the introduction of the MC0 Series, the designer can now build in more performance with greater reliability and operating protection. Plus overall system cost savings can often be realized. Capacitance shall be measured at 25°C and at or referred to a frequency of 1 kHz. DC working voltage ratings at +125°C, are 100VDC, 200VDC and 400VDC. Note: The fifth character of the part number represents the DC voltage rating (i.e. D=100 VDC, F=200 VDC, etc.). Additionally, the tenth character of the part number represents the Tolerance (K=±10%, J=±5%, G=±2%, F=±1%). Capacitors shall withstand a DC potential of 200% rated voltage for two (2) minutes without damage or breakdown. Test voltage must be applied and discharged through a resistance of 1 OHM per volt, minimum and at 25°C. When measured at 1kHz, the dissipation factor shall not exceed 0.3% from +25°C to +125°C. Wrap & Fill Tubular Configuration.